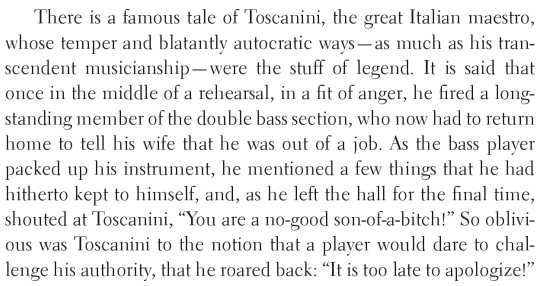 Toscanini was known for many things: being a meticulous musician, his political stances against Nazism and Fascism, and his famous temper. Once in rehearsal, he intensely questioned a viola section about their inability to play together. But before they could respond, he yelled “Talk to my hand, for my ears can not stand your horrible playing any longer!” This later spawned a catch phrase for a generation unfortunate enough to appear on late afternoon talk shows. Ok, that’s actually not true, but there are many documented stories regarding his behavior on the podium. What you play is WRONG? dat-Dah, dat-Dah? andante! How could…believe, that you could be so stupid? You can’t read NOTES! Additionally, this archive of a rehearsal of Aida is fairly telling of the atmosphere, even if you don’t catch everything he says. He mixes his precise musical ideas with a healthy does of, well, you’ll hear. There are a few more on youtube you can search if you are interested.